Before you move your orchids, it is important to remember that the flower spikes need a steady placement in regards to its light source while the buds are developing. It will probably be beneficial to wait until most of the buds have opened, because if you don’t then the buds will begin to grow at strange angles and when they open they may open up at an angle that doesn’t display the entire bloom. 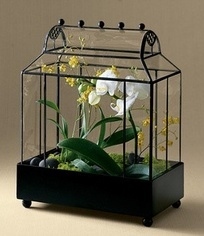 Orchids can be displayed in a number of ways, so this is where you can get creative! The use of a cake stand, empty fish aquarium, Wardian cases, or even an empty bird cage can make for a great display. 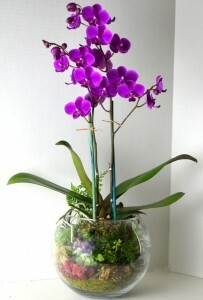 For orchids that are too large to fit in cases, you may want to use a large decorative bowl to place the orchid in and cover the top with moss, stones, or other materials for a beautiful presentation. If you’re growing orchids in hanging baskets, finding the perfect location within your home can really create the wow factor. If you are lucky enough to have multiple orchids in bloom at the same time, you may want to group them together. Before you group any of your orchids together, it is important that you inspect each for signs of pests or disease. Make sure you only place healthy orchids next to each other so that if one orchid is infected, you don’t transfer that to your other orchids. Another impressive way to display your orchids is a living wall (vertical display) which you can either purchase or create on your own. Many vertical walls are meant for the purpose of growing the orchids directly on the vertical service, though you can easily attach your potted or mounted orchids on it. This is a great way to save floor space and can create a stunning display. After you have found the perfect way to display your orchids, you will want to make sure that you continue to take proper care of them. If you have added any decorative moss or pebbles over the top of the potting medium, you will want to be sure to remove it all before you water your plant. In order to keep your orchids from drying out too quickly you can mist them daily, but be careful not to mist the blooms because the water drops will cause the flowers to spot. Also, make sure that the location where you are displaying your orchids doesn’t get too hot or too cold because this can cause bud blast and cause the blooms to fall prematurely. A great tip to make you orchids look their best is to wipe their leaves with a damp cloth and to really make the foliage shiny and to get rid of water spots, you can gently rub the leaves with a mixture of mayonnaise and water. Another mixture to get rid of water spots is lemon juice diluted with water. 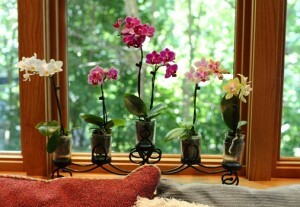 The options are endless when coming up with ways to display your orchids. Experiment with different locations until you find the perfect way to display your orchids that will really impress your guests!